Upper Devonian, Middle Frasnian, Domanik Formation. Borehole Shuda-Yag-1003: fig. 1, 2, 6, 7 - sample 29 (depth 105-106 m), fig. 3 - sample 72 (depth 71.9-72.4 m), fig. 4, 5 - sample 73 (depth 71.4-71.9 m); the Ukhta River, sampling site no. 4, sample Â-22: fig. 8; borehole Shuda-Yag-1002: fig. 9 - sample 14 (depth 66.6 m). Fig. 1, 2. 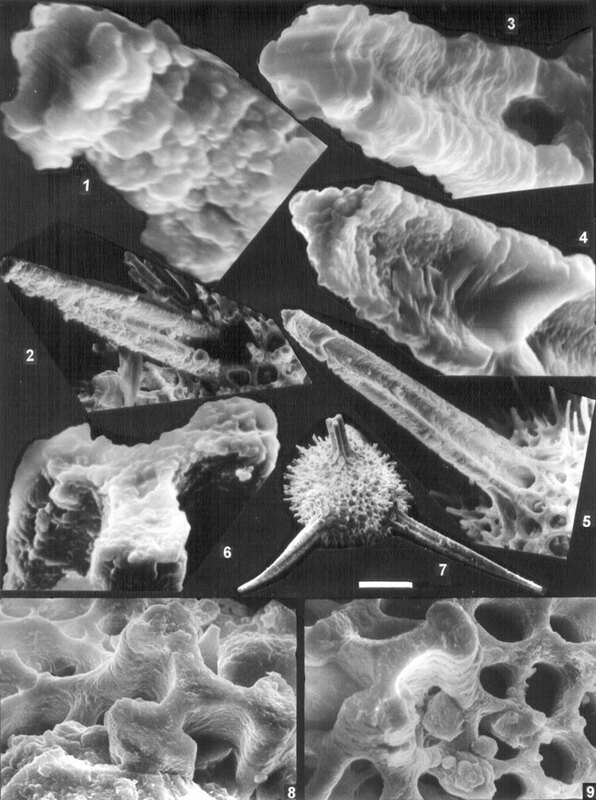 Bientactinosphaera conglobata (Nazarov), FF-P001/025-004404: 1 - (bar=6µm), 2 - (=33µm). Fig. 3. Helioentactinia aster Aitchison, FF-P001/055-08508 (=4µm). Fig. 4, 5. Bientactinosphaera variacanthina (Foreman), FF-P001/015-08817, 4 - (=33µm), 5 - (=7µm). Fig. 6, 7. Bientactinosphaera variacanthina (Foreman), FF-P001/015-04401, 6 - (=100µm), 7 - (=7µm). Fig. 8, 9. Bientactinosphaerapinica Afanasieva, sp. nov.: 8 - FF-P001/045-13334 (=10µm); 9 - FF-P001/045-13423 (=15µm).